Ready to Rock Your Empty Nest? A few years ago, I was facing my own empty nest and wondering what to do with myself when the days of being primarily a mom were behind me. I started Midlife Rambler to explore the future and provide support for all the women out there going through the same thing. 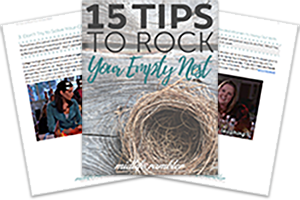 My free e-book, 15 Tips to Rock Your Empty Nest, contains all the best tips I've learned over the last few years to help you adjust to your new phase of life and plan what's next. Sign up now and you'll receive your free e-book right away! Plus, you'll get a special newsletter each week with content just for subscribers. Of course, you can unsubscribe at any time. Sign up now to receive your free e-book right away!